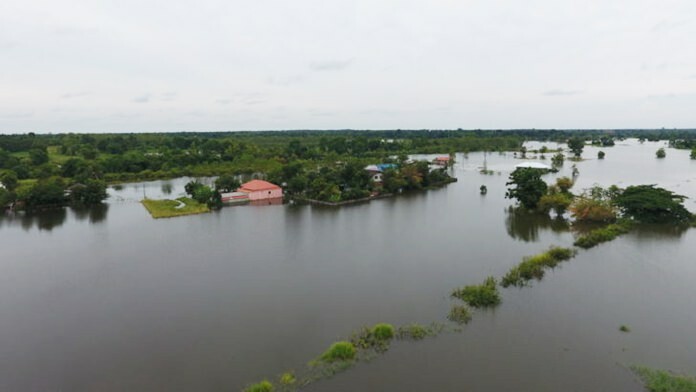 Nong Khai, 10th September 2018 – Officials have reported that several areas in close proximity to the Mekong River are still coping with inundations, despite the fact that the excess water is slowly receding. Responsible units indicated that tributaries without sluice gates, such as the Lam Huay Suay creek, are overflowing their banks, triggering floods in nearby agricultural zones. Authorities at Phon Phisai District’s Wat Luang Sub-district reported that the area has been submerged by a 20-40 centimeter deep flood for over a week, adding that the inundation has damaged several stores leaving vendors no choice but to set up stalls along the road. The local administration expects that it will take at least a week for the flood to subside. According to the Water Resources Office in Nong Khai, the water level in the Mekong River was measured at 12.17 meters on September 9th, 17 centimeters lower than the day before. The office expects that the water level will continue to recede, if there is no rain in coming days. Similarly, the water level in the Mekong River has dropped by 64 centimeters. Meanwhile, several provinces are reportedly still recovering from the effects of Tropical Storm Bebinca and the southwesterly monsoon, which wreaked havoc in the North and the Northeast of the Kingdom last month. According to the Department of Disaster Prevention and Mitigation, affected provinces were Nong Khai, Bueng Kan, Sakon Nakhon, Kalasin, Ubon Ratchathani, Nakhon Nayok, Prachinburi, Phetchaburi and Saraburi. The department is working around the clock with the military and other concerned agencies to drain flood waters out of the affected areas and deliver survival kits to affected residents.